At some point in most people's life, they would have played with some form of RCgadget. I know as a kid I sure did and so did many of my friends. Hours were spent playing with remote controlled cars, boats and even helicopters. I even remember going through an obsession with Tamiya cars. However, it was a small introduction into the world of RC in comparison to Juan Gaspar's experience. 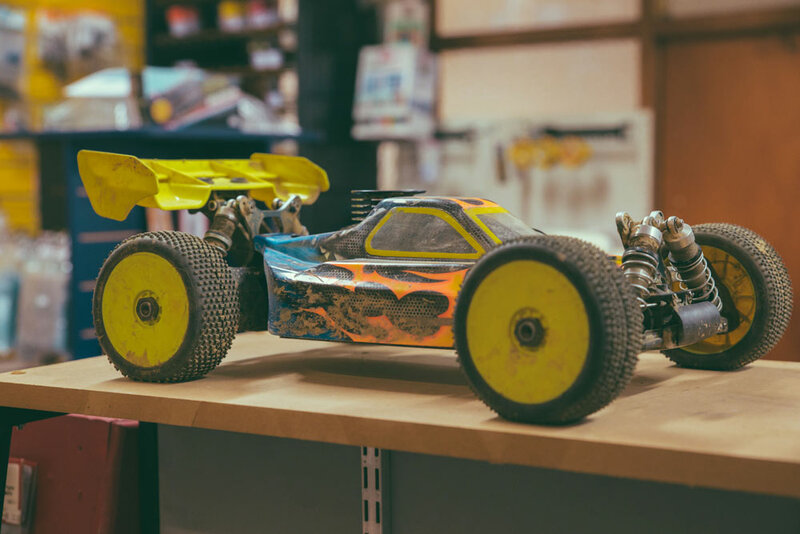 What started as a hobby at age 10 with an RC car that was a gift from his parents has lead to running his own successful business specialising in RC. RC is Radio Controlled or simply described as a wireless style controlled vehicle. It includes vehicles such as boats, cars, tanks, motorbikes, helicopters or planes to name a few. Basically, anything you can control with a radio unit that runs on a distinct radio frequency. Not to be confused with Remote controlled which is Infra Red, used to control your TV. Juan has been involved with Radio Controlled technology for the past 30 years. He raced RC cars until he was 19 where he moved into the Belgium Airforce as an F16 technician. Whilst there he discovered RC Helicopters and on his return to NZ continued to follow his interest in RC controlled vehicles. This hobby has lead to identifying a potential market for vintage RC vehicles. Pursuing this market, Juan began collecting and selling such vintage items. What started as a hobby soon started to scale to a sizeable collection that could be considered one of the largest vintage collections in New Zealand. A collection that grew too big for the house, hence the move to open a store. 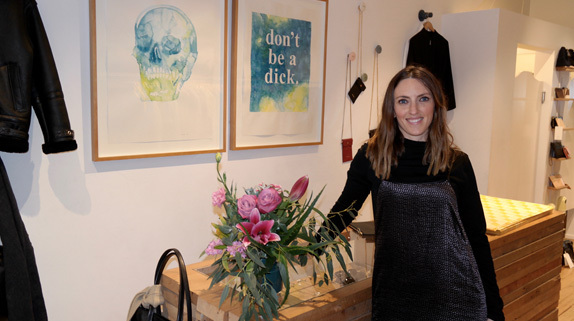 About 8 years ago Juan opened a shop in Mornington that operated for 3 years before outgrowing the store and shifting down to Vogel Street and a larger premise. Over the years, Juan has seen a gradual demise of other hobby stores. 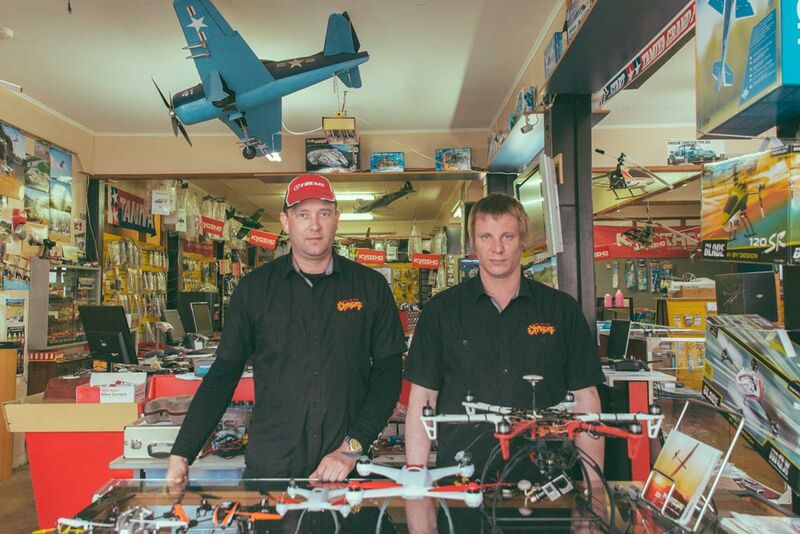 This has lead to Extreme Hobbies being one of the last ones standing in Dunedin that specialises in RC. An area that has been in hot demand lately with the rise of aerial Drones and Quads popularity. This emerging market is a byproduct of connections being made to the potential use of such technology for industry applications. A shift in mindset from play to work changing the perception that such technology is not only for recreational use. Such projects include creating a large aerial Drone for a logging gang. Extreme Hobbies helped develop a Drone that can assist in pulling out the wires for their log haulers utilising integrated tow release hooks. The drone can fly out past a km in range all through FPV goggles remotely, almost like virtual reality. Extreme Hobbies also assist some really smart people like university professors and tech companies who are pushing the boundaries of the technology. However, this custom work is not limited to just aerial drones. Extreme Hobbies can also help you with custom built, one off RC vehicles like a custom built Jet Boat that they created for Otago Rugby player Hayden Parker. This is definitely one of a kind. It houses a 30cc engine with a single stage jet unit. Extreme Hobbies are also involved and have setup a car racing club where their members can push their skills. Not to be taken lightly as what I am told it is pretty intense. Juan built a track that has hosted the South Island and National champs in the past. Here drivers race their cars at over 80km and jump them over 15m. Something that demands incredible hand eye coordination. Another aspect to what Juan does with his company is related to educating kids. On a number of occasions, he has taken this technology to schools where he will break down a car and put it back together for them. Showing the kids all the parts that make up the car like the diff, clutches, radio gear, engine and tyres. Then showing them how it works and what they are capable of. Something kids find incredibly interesting an what can expand their mind and start to think about the electrical and mechanical technology that is being used. Extremely fascinating when you think that such motors used in these cars are some of the most powerful engines in the world. A combination between a diesel and a 2 stroke engine. Such 3.5cc engines that put out 3 horsepower at 40,000 rpm. Despite all the custom and highly technical work that Extreme Hobbies engages in it is still an everyday person or family who is not into racing and just want to have fun that makes up most of their business. They want to buy gear that they can go out with and give them a good blast knowing that it will last. With this in mind, Extreme Hobbies have a strong policy on only supplying the best technology. Juan strongly advises people not to buy the cheap technology, especially if you want it to last. Extreme Hobbies stock only the best brands. When buying items such as these it is all about serviceability. The ability to be able to source parts, if you can not buy parts 2 years down the track what is the point. Juan describes that most people will run them for a while but will then put it aside for a year or so without thinking about it. One day someone will pull it out and something will break. In this case it is always good to know that it can be fixed and you can continue to enjoy it for years, especially when you can spend a considerable amount of money on these items. If you are interested in RC devices such as these and what to know more about them, Extreme Hobbies are the people to go see. If you are seeking advice, wanting to get into the industry, need something fixed or are looking for that custom piece these guys do it all. Even if your not in the market to buy something taking a good browse around the store is fascinating in itself. Especially, having a good look at all the vintage items on display. If you're lucky, you might even get a chance to use their aeroplane simulator where you can fly a simulated RC plane using a real RC controller! Definitely a great place to check out for yourself or with the kids!